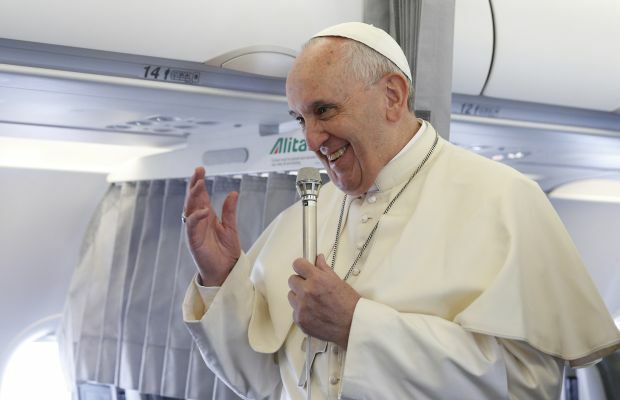 ABOARD THE PAPAL FLIGHT FROM STRASBOURG, France (CNS) — Pope Francis said he would “never close the door” on dialogue with the Islamic State in an effort to bring peace to a region of the world suffering from violence and persecution. He also said that “terrorism” could describe not only the actions of such extremist groups but also those of some national governments using military force unilaterally. Meeting reporters Nov. 25 on his return flight from Strasbourg where he addressed the European Parliament and the Council of Europe, Pope Francis said terrorism is a threat the world must take seriously. But Pope Francis also told journalists that the threat of terrorism is not the only horror weighing on the world. “Slavery is a reality inserted in the social fabric today, and has been for some time: slave labor, the trafficking of persons, the sale of children — it’s a drama. Let’s not close our eyes to this. Slavery is a reality today, the exploitation of persons,” he explained. Nations have a right and duty to stop “unjust aggressors,” he said, but they must act in concert and in accordance with international law. A Spanish reporter asked Pope Francis about a man from Granada, Spain, who wrote to the pope about a priest who sexually abused him. The correspondence set off a widespread police investigation, the arrest of three priests and a layman, and the suspension of several priests by the Archdiocese of Granada in November. The pope said he received the letter. “I read it and I phoned the person and I told him, ‘Go to the bishop tomorrow,’ and I wrote to the bishop and told him to get to work, conduct an investigation,” he said. “This going out in order to find and dialogue with others — Europe needs this today,” he added. Another reporter told the pope that his remarks at the European Parliament on employment, the dignity of human life and the role of the state in helping citizens made it seem like the pope could be a card-carrying member of the Social Democrat Party.